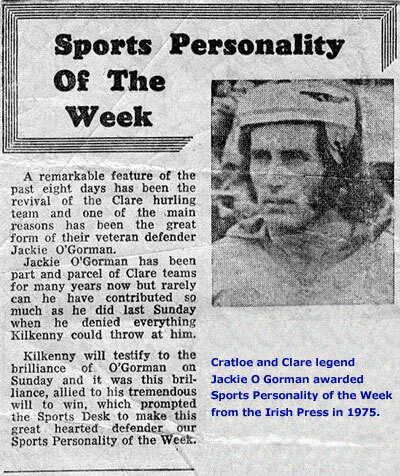 Jackie O Gorman rates as arguably one of the finest defenders that ever wore the Saffron and Blue. A teak tough half and corner back, O Gorman hurled for the county in every single provincial championship from 1968 to 1979. In 1977 and 1978 he played on the famed Clare sides to win back-to-back National league championships. O Gorman also has the distinction of playing in four Munster Finals in 1972, 74, 77 and 78 and acting as a selector in two others in 1981 and 1986. Jackie hurled in numerous Railway Cups with Munster and was also chosen as a replacement All-star.